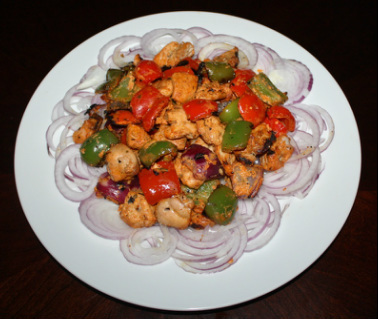 ﻿C﻿hicken kebab is one of the popular dishes not only in India but all over the world. The spices and coloring gives these kebabs a wonderful appearance. The boneless chicken pieces are marinated in yogurt and seasoned with spices, and then baked in tandoor. A Tandoor is a cylindrical large drum like oven made from clay heated with charcoal or wood, they can reach a very high temperature; this high temperature helps in cooking the surface of the meat very fast and hence sealing all the juices inside. You probably do not have a tandoor but outdoor grill or the oven will roast the chicken kebabs as good as tandoor will do. The nicest thing about this dish is that it is easy to make and you can cook on the grill or in the oven anytime you feel the urge to eat some. Chicken kebabs serve the purpose both of the appetizers as well as the main course. You can wrap the kebabs in a roomali roti with onions and coriander chutney and make a kati kebab or eat with onion brown rice. strainer and let the chicken drain well, otherwise marinade gets watery. 4. In a large bowl, add yogurt, lemon juice, grated ginger, minced garlic, tandrooi chicken masala, red chili powder, turmeric powder, garam masala, 1 Teaspoon chaat masala kasoori methi, ½ teaspoon salt, red color, and melted butter or ghee and mix them together and make a smooth paste. vegetables out of the refrigerator and allow it to come to room temperature. prevent breakage and burning during grilling. 3. Chop 2 onions in rings for serving with the kebabs. Keep them aside. basting brush lightly oil the grate of the grill. different time to cook. If you wish you can thread them on the same skewer. for 5 minutes because vegetable takes longer to cook then chicken. longer pink in the center. Do not overcook otherwise chicken become hard. 11. Kebabs are also served with rice as a main course. 12. 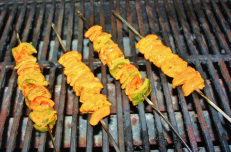 Serve kebabs immediately after cooking otherwise they become hard. 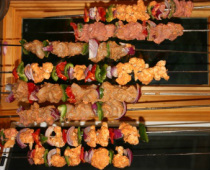 Instead of roasting kebabs on the skewers they can be roasted separate in roasting pan then mix them together. Roasting kebabs in the pan is much easier. ﻿ Kebabs can be grilled in the oven. You can bake the kebabs in the oven with or without the skewers. 1. Preheat the oven at 400 degree. Turn the oven to broil. With a brush baste the chicken and vegetables with oil or melted butter. 2. Line the baking tray with aluminum foil to catch the drip if any so that oven tray does not end up with hard dried and burned marinade. Place the baking rack over the tray and place the skewers opposite to the rack tines so that chicken and vegetables do not drop through the tines. 3. Periodically keep turning the skewer around, and once chicken is browned on all sides and tender and vegetables are cooked take them out from the oven. If you want you can char them a little but do not cook chicken for too long otherwise chicken become hard. Timing of cooking varies because oven temperatures vary from oven to oven. 4. 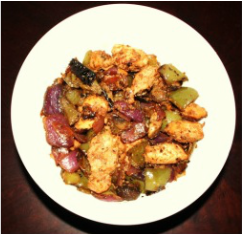 Instead of grilling chicken and vegetables on the skewers you can also grill them on a grilling pan. If you do not have oven, tandoor or barbeque grill don’t get discourage you can still grill delicious kebabs in the frying pan. 1. On medium heat add 2 tablespoon of oil in a wide non stick frying pan or use regular tawa and add more oil while shallow frying to prevent it from sticking. 2. Place the vegetables on the pan and fry for 12 to 15 minutes, gently keep turning the vegetables around every 2 minutes or so until all the sides are evenly browned. If you want to give little chard look then in the end turn the heat on high and stir the vegetables until you have the desired looks. 1. 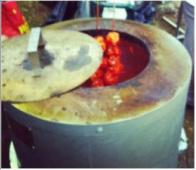 Kebab can be cooked in the tandoor. Thread the chicken and vegetables on the long tandoor skewer and cook in hot tandoor for 8 to 10 minutes, depending on the thickness of the flesh. 1.Boneless chicken breast could be used for kebabs but boneless chicken thighs are more succulent then breast. 2. Yogurt tenderizes and flavors the meat, longer they marinate more succulent and delicious they taste.